As you may be noticing, I’m a project girl. I love taking old things and making them new, but in a simple way that won’t take up too much time. 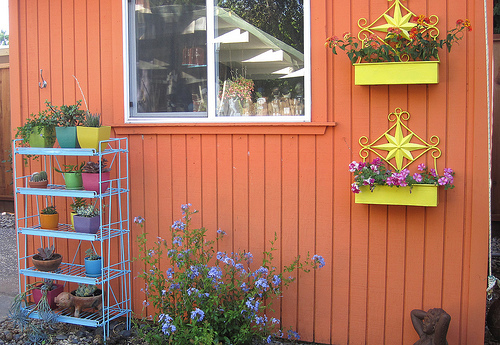 I recently did a little DIY project for my backyard with tons of color. I’ve really gotten into spray painting these days. It’s easy, mostly mess-free and gives you instant results. Just throw some cardboard under your object and get to sprayin’. How fun is this? I found a wire rack and 2 planters on the side of the shed during a summer clean up and instead of trashing them, recycled them. Here they are all purty and filled with flowers and plants. As you can tell, we’re not afraid of color at our house. I’m about to keep it real right now. I’m so not a green thumb. In fact, I’m such a brown thumb that my husband has dubbed me the cactus queen. I can keep cactus and orchids alive, but that’s about it. 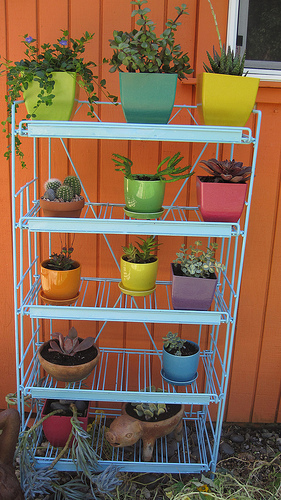 After painting the rack (yep, with my new favorite Home Depot purchase — spray paint) , I went to the nursery to get some plants and pots. Who knew they had such fun, colorful options? Not this grim plant reaper! 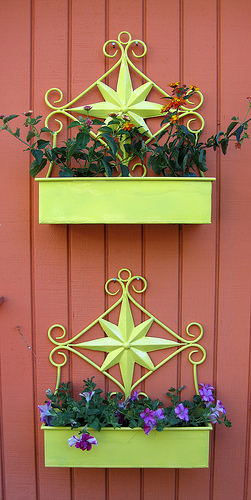 Viola, a bright, sunny new planter! I hung them on the shed (which isn’t a shed at all, but the husband’s man cave) to add color and balance to the area. I took a chance planting perennials instead of cactus in these, but I had to be daring and go for it. I’m keeping a watchful eye out to make sure they get water when they need it, as to keep these puppies alive and well. 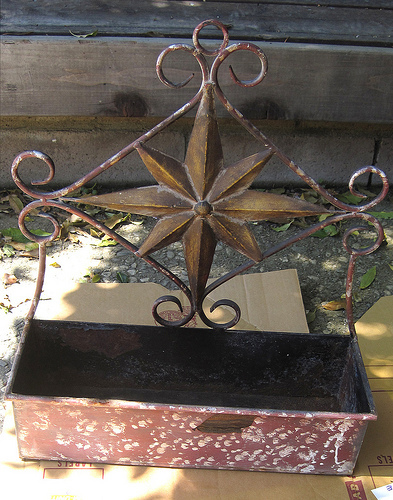 This entry was posted on 07/19/11 and is filed under color inspiration, home style, inspiration, random goodies.